Military Music Blog – Altissimo! The number of military bands grew tremendously during the first years of the Civil War (1861-1865) when expenses were assumed by the federal government. In 1862 Congress consolidated over 200 regimental bands into about 60 brigade bands and limited the number of musicians in military bands to sixteen. Some military bands had a less-than-professional appearance. The band pictured above was under the command of General James A. Blunt in Kansas in 1863. Brigade bands performed concerts for the officers, provided music for marching troops, and aided in kitchen and medical duties at hospitals and in the field. This over-the-shoulder, or backfire, cornet was played by George Bind of Company C, 7th Kansas Cavalry during the Civil War. These horns were designed to point backwards over the musician's shoulder so that troops marching behind the band could better hear the music. This horn was manufactured by Gilmore, Graves & Co. of Boston around 1861. Commanding officers had a wide latitude in the uniforms and outfits worn by band members, as is apparent with the band at Fort Hays in 1886. Regimental bands accompanied American troops to Cuba and the Philippines for "The Splendid Little War." The 20th Kansas Volunteers were commanded by Frederick Funston of Iola. Members of the 20th Kansas Band distinguished themselves in the Philippines, often taking part as stretcher bearers and sometimes in combat. After the war a number of musical compositions, like Funston's Fighting 20th March. were written in tribute to Funston and his men. Over 200 American military bands were stationed in Europe during World War I. Because the quality of these bands was fairly low, military bandmasters' schools were established. Many Americans got a musical education while serving in the military, and after the war pursued careers in music education in the public schools. 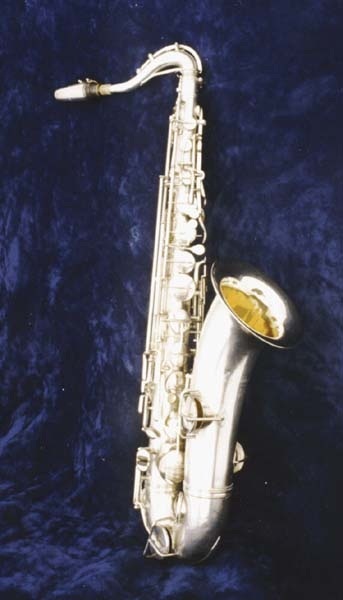 Corporal Martin G. Miller used this tenor saxophone while in the band of the 130th Field Artillery, 35th Division, from 1917 to 1919. It was manufactured by Frank Holton & Co. of Chicago around 1903. In 1941, the War Department authorized the organization of over 400 bands for the American military. Smaller ensembles often formed out of the larger concert bands, and popular music (such as jazz and big-band music) was reflected in the selections performed by these military bands. Members of the 1st Infantry Division Band from Fort Riley, Kansas, formed a rock 'n roll band to entertain the troops while stationed in Saudi Arabia in 1991. A special ceremony commemorating the 50th anniversary of the sounding of Taps by U.S. Army Bugler Keith Clark at the funeral of President John F. Kennedy was held at the Old Amphitheater beginning at 10 AM on November 12th. This special event was sponsored by Taps For Veterans, an organization devoted to providing live buglers for military funerals and ceremonies, and was attended by military and civilian buglers from across the nation. The Joint Service Colors Team presented the colors and music was provided by the United States Army Band (Pershing’s Own). Speakers included Jack Lechner, Deputy Superintendent of Arlington National Cemetery, Nancy Joy McColley, daughter of Sgt. Keith Clark and James Swanson, noted historian and author of “End of Days: The Assassination of John F. Kennedy.” Edward Hunter, who 50 years ago wrote letters to Sgt. Clark following the funeral, was recognized. Original members of the United States Air Force Pipe Band who played “Mist Covered Mountains” at the funeral were in attendance to reprise the tune performed at the funeral. The ceremony ended with a massed sounding of Taps by buglers from across the nation conducted by Colonel Michael Colburn, Director of the United States Marine Band. Following the ceremony, buglers moved to designated positions around the cemetery and sounded Taps at 12 noon in honor of Clark and all veterans who served our nation. A wreath ceremony was held at the Tomb of the Unknowns at 1:15 PM. Members of the Clark family layed the wreath. The ceremony was coordinated by Jari Villanueva, USAF Retired, who served at Arlington as a bugler for 23 years and is the author of “24 Notes That Tap Deep Emotions”. Arlington National Cemetery opened the Taps Exhibit on May 29, 1999. This exhibit focuses on the role of the bugle from 1800 to the present. It is the project of Master Sergeant Jari A. Villanueva (retired), trumpeter with the Air Force Ceremonial Brass, who collected and procured hundreds of artifacts to be in the exhibit. He, along with a team of musicians, historians and advisors created a display that sheds light on a significant, but overlooked, part of American history. The centerpiece of the exhibit is the bugle that was played at the funeral of John F. Kennedy, the nation's 35th president. Taps was sounded that chilly November day by Army Sergeant Keith Clark and the story of that day will be told from his perspective. Other artifacts in the exhibit include two Civil War bugles, a keyed bugle and the sword and spurs worn by Union General Daniel Butterfield, the officer credited with deriving Taps from a previous bugle call known as Tattoo. Several buglers have been Medal of Honor recipients. Buglers John Cook and Calvin Titus distinguished themselves by gallantry in the heat of battle. John Cook was only fifteen during the battle of Antietam but volunteered to act as a cannoneer under heavy enemy fire. Calvin Titus was the first to scale the wall of Peking during the Boxer Rebellion in 1900. The Taps Exhibit includes a wide variety of memorabilia including bugles of every era since 1800. Photos, sheet music, manuals, uniforms, bugler insignias and items related to bugles are also featured. Buglers and bugles were a part of many historical events but they have also found themselves in the middle of popular culture. Bugles have been used as ornaments and on tobacco cans, not to mention the symbol in the middle of car horns today. 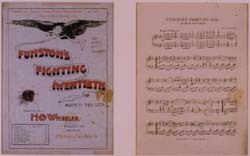 During wartime, buglers and bugles were often depicted on cards, music and other items. Taps is sounded at Arlington National Cemetery more often than any other place. "The one thing that is common to every ceremony at Arlington is that Taps is sounded. It's a call unique to the United States military that is sounded at funerals, wreath-layings, and memorial services" states Villanueva. Arlington, known as our Nation's greatest shrine, will honor those who have sounded the eloquent melody. Arlington National Cemetery is located adjacent to Ft. Myer in Virginia. The Visitor's Center is located off of Jefferson Davis Highway at the Memorial Bridge. It is also accessible from the Metro at the Arlington Cemetery stop. Altssimo! Recordings and Naxos of America proudly salute the memory of great Americans. November 19, 1863 This year marks the 150th anniversary of many monumental events during our nation’s Civil War, but none match the magnitude of Gettysburg. Nowhere else was the conflict that split the United States in two so bloody and devastating. No other locale serves as both the largest and most important battle of the Civil War, but also as a microcosm of the war itself. Gettysburg, Pennsylvania is a place near and dear to my heart. I spent four years of my life studying at Gettysburg College, a small liberal arts institution that pre-dates the battle itself. Living in Gettysburg, you cannot escape the civil war culture that permeates so many aspects of the community, and most students, like myself, are quick to embrace it. They say that in Gettysburg, seeing a reenactor is the first sign of spring. Walking down the street, you see establishments such as the Lincoln Diner, plaques marking the numerous civil war buildings, and at night, ghost tours led by guides in full 19th century garb. Every summer in Gettysburg involves multitudes of visitors paying homage to the hallowed ground that is the battlefield, and every year the Gettysburg Address plays a huge part in the celebration and commemoration. Just as the memories of what happened 150 years ago remain alive through the countless monuments and epitaphs, the music of the civil war can still be heard, both in Gettysburg and across the nation. Altissimo! carries an excellent compilation titled Blue and Gray: Songs of the Civil War, which features a series of medleys and arrangements of folk tunes indicative of the era. The disc includes a version of Yankee Doodle by Morton Gould, which I particularly enjoy. But while civil war music is perfect for any occasion, today specifically marks the 150th anniversary of the oration of the Gettysburg Address. It is a day not only to marvel at the speech itself, but also to commemorate our sixteenth president, and there is no better way to accomplish this than through music. While Abraham Lincoln was himself not a musician, he is consistently remembered as a lover of music, and many pieces have been written to celebrate this fact. Aaron Copland’s Lincoln Portrait is one of the better-known works of this sort. Although originally for orchestra, Lincoln Portrait has been arranged for wind band, and is frequently performed by the bands of the United States military. The music itself is very much in the style of 1940’s Copland, littered with brass chords and fanfares, as well as the occasional folk tune. However, the most characteristic element of Lincoln Portrait is the narration, which quotes many of Lincoln’s speeches and writings, including the Gettysburg Address. The Altissimo! CD A Lincoln Portrait features Copland’s work (with narration by Walter Cronkite), as well as many other pieces related to Lincoln and his time. It’s a good way to both commemorate the events of day, this year, and as always, to support our nation’s military and the music they make. Stay connected with Altissimo! through Facebook and Twitter, and also subscribe to our email list for updates on new releases and promotions! Contributed by Jack Kopstein Music that stirs the soul has become the very essence of our salute to veterans everywhere. Originally known as Armistice Day, the eleventh hour of the eleventh day of the eleventh month, November 11, 1918, was declared the day of the armistice in WWI. Later following WWII, the official name was changed to Veterans Day to honor all of those who have served and are still are serving in the military. Cities and organizations around the area are holding Veterans Day observances to remember all of those brave souls. All wars have many things in common. One thing is music. From the American Civil War and World War I and World War II to the wars in Vietnam, Iraq, and Afghanistan, music has proven vital to heading off to war, coming home from war and remembering war. The music of war memorial is solemn in nature. That’s probably because in the long run, war always seems a solution of last resort – sometimes necessary but rarely desirable and never totally victorious or without terrible cost. It is a bittersweet and poignant, not joyful, occasion. And that is how remembering it should also be. A piece by Sir Edward Elgar is often used to remember the dead and the fallen, one that is particularly popular in Britain and Commonwealth countries on Remembrance Day, which is similar to the American Memorial Day. It is the “Nimrod” Variation from Elgar’s wonderfully effective “Enigma” Variations. The military band version is very effective and is played every year at the war memorial in Ottawa , Canada. Remembrance Day services are generally held at cenotaphs and war memorials, or in a variety of churches and halls. In addition to symbolic laying of a wreath at a memorial, the services may include a number of hymns, recitals of poems, and short speeches or sermons. The key music played at or shortly before 11am is "the last post", a Bugle Call historically played at the end of the military day and traditionally at military and ceremonial funerals. This is followed by a period of silence, and then the "rouse" is played, another bugle call which in a military context is a signal for soldiers to get up. The National Anthem and a number of Patriotic Hymns are often played. Below you will find a number of pieces of music which are suitable for Remembrance Day services, but also in most cases for military funerals or the funerals of individuals who have died in conflicts. Films set during the war years have also used themes and symbols associated with Remembrance Day, and some of these may prove fruitful in suggesting suitable music for Remembrance Day. One piece of film music in particular is the "Hymn for the Fallen" by John Williams. It was composed for "Saving Private Ryan" but is only used in the End Titles of the film. It is one of the most beautiful instrumental hymns. Taps is a famous musical piece, played in the U.S. military during flag ceremonies and funerals, generally on bugle or trumpet. The tune is also sometimes known as "Butterfield's Lullaby", or by the lyrics of its second verse, "Day is Done". The bugle call was composed by the Union Army Brigadier General Daniel Butterfield, an American Civil War general who commanded the 3rd Brigade of the 1st Division in the V Army Corps of the Army of the Potomac. Butterfield wrote the tune at Harrison's Landing, Virginia, in July 1862. Taps also replaced "Tattoo", the French bugle call to signal "lights out." Butterfield's bugler, Oliver W. Norton, of Erie, Pennsylvania, was the first to sound the new call. Within months, Taps was used by both Union and Confederate forces. To all who have served and are serving and will serve, thank you. We here at Altissimo! hope you and your loved ones find this article fitting and a worthy memorial to our service people everywhere and those whom have come before. Tattoo 1967 was planned to be a bit different. It would comprise of 16 scenes each depicting part of Canada’s military history from as far back as the first French military units in Canada in 1665, to the British in 1782 right up to the UN Peace Keeping forces Canada contributed in the 1960s, three hundred years of military history compressed down to a show of two and one half hours. Not only that, Tattoo 1967 was designed to travel across Canada performing in cities from coast to coast commencing in late March of that year and concluding in late September. This may sound like a massive undertaking for the military but thanks to thousands of hours of planning and many hours of rehearsal time in Picton, Ontario in February and March of 1967 the show was ready to cross the country. The renown of the Sousa band was not accomplished without a most serious and comprehensive search for established talent among the musicians. Sousa prided himself in hiring accomplished soloists. Beyond that he also realized the need for performers whom he could rely upon year after year. The marches on this album constitute some of the finest writing of many of the military and civilian composers of the last two hundred years in America. On Dress Parade is a valuable asset to any band music library. The first program presented on July 3-4, titled "Star- Spangled Celebration," featured the New York Philharmonic and the United States Coast Guard Band (in its Philharmonic debut). Conducted by Captain Kenneth W. Megan, they performed works by John Philip Sousa, Aaron Copland, and Leonard Bernstein. The concert also featured the World Premiere of the orchestral version of Bramwell Tovey's "The Lincoln Tunnel Cabaret for Trombone and Orchestra," with Principal Trombone Joseph Alessi as soloist. Growing up he apprenticed in carpentry, shoe-making and plastering. He worked on a "shovel brigade" at the McNabb Furnace, and described the music made by the workers as they beat shovels, altering the tone while thrusting and withdrawing the metal part against the iron buggies to pass the time while waiting for the overfilled furnace to digest its ore. "With a dozen men participating, the effect was sometimes remarkable...It was better to us than the music of a martial drum corps, and our rhythms were far more complicated." He wrote, "Southern Negroes sang about everything...They accompany themselves on anything from which they can extract a musical sound or rhythmical effect..." He would later reflect that, "In this way, and from these materials, they set the mood for what we now call blues". The following was taken from the Canadian Veterans Affairs Memory Project and are the words of Zona Davidson (nee West) who was a member of the RCAF Woman’s Division Band on cornet. “I was in the first all-girl military band [part of The Royal Canadian Air Force Central Band] in the world. A few months after, the army decided to get a girls’ band too. They got into the position where they couldn’t get people who could play, therefore, they took beginners and trained them. There are rules and regulations about what time you’ll get up and what time you’ll go to bed. And I was used to getting up around 8:00 am and staying up and reading until as late as 3:00 am. And that wasn’t allowed. We had to be on the parade ground at 8:00 am dressed, brass polished, the works. And then we reported and got our meals and then reported down to the band hut and practiced. And waited for more people. When I first got there, there was only five of us, which isn’t enough for a band. So we were marking time. Well, and Central Band was in the, there was a band hut and there was a whopping big room that Central Band, there still is a Central Band. At that time, it was 60 pieces of the best in North America. And I don’t know what the situation is now and I don’t know if they’re still in [RCAF Station] Rockcliffe [near Ottawa, Ontario] or not. I noticed a little article in the paper the other day when there was some beginning of parliament or something like that, these government things. Anyway, Central Band was there. And at the time that I knew them, there was 60 pieces and they were the best in North America. You have to pass trade tests before you get accepted. And then that’s all you do all day, practice or give concerts or be on parade. So obviously, you get pretty good. You can’t help it if you’re good, that’s all you do all day long. Marches are great but concert stuff, we were able to play pretty doggone nice music. And all kinds. Well, I was in heaven. I think most of the girls were. Five of them were married, their husbands were overseas. A couple more got married during the two years, 26 months that there was such a thing. But I don’t know, it was just … Well, it was, let’s say it was the best two years of my life. I was doing something I loved, playing music”. The following is a review of Dr Jill Sullivan’s Book “Bands of Sisters” from RESEARCH MATTERS –Arizona State University Members of the Marine Corps Women’s Reserve Band, which played for two years during World War II, from 1943-1945, sometimes marched in high heels during a last-minute parade. Question: What sort of musician would dare to march in a parade wearing high heels – and playing a Sousaphone? Answer: A member of the Marine Corps Women’s Reserve Band, which played for two years during World War II, from 1943-1945. Most people know that women were called up to work in factories during World War II, such as the iconic “Rosie the Riveter,” but few probably are aware that women also stepped forward to help the war effort by making music. Jill Sullivan, an associate professor of instrumental music in the ASU School of Music in the Herberger Institute for Design and the Arts, was not aware of the all-female World War II military bands either, until she attended a luncheon sponsored by Women Band Directors International (WBDI) during the Midwest Band and Orchestra Clinic in Chicago in December 2000. As the conversation flowed, she discovered that she was seated next to octogenarian Master Sergeant Charlotte Plummer Owen, who had directed Marine Corps Women’s Reserve Band – the group that marched in high heels – and soon learned that there were all-women bands in all of the U.S. military branches during World War II. This was a revelation to Sullivan, who said, “Never in any of my music history classes throughout any of my education did I learn of all-female ensembles. We just accepted that historical ensembles were all male most of the time. It was quite a shock for me to find locations where women were employed professionally.” At the same luncheon table was Gladys Wright, founder of WBDI, who unknowingly issued a challenge to Sullivan. “She made the remark, ‘I wish someone would do research on those World War II women’s military bands,’” Sullivan said. “I thought that was a good idea, and so I wrote a book on this topic.” Her book, published last September, is called titled “Bands of Sisters: U.S. Women’s Military Bands During World War II.” It’s part of the American Wind Band Series published by Scarecrow Press. After receiving her first grant to travel to Washington, D.C. from ASU's College of Fine Arts (now Herberger Institute for Design and the Arts), Women and Gender Studies and the School of Music, she began her research by combing the Library of Congress and the Women in Military Service for America archives in Arlington, Va.; the Smithsonian Institution; the U.S. Army Women’s Museum and archives at Ft. Lee, Va.; and the Marine Barracks, where the U.S. Marine Band (The President’s Own) rehearses and stores its archives. One of the important items artifacts she found in the archives was band rosters, some with post-war contact information. “I was able to begin collecting oral histories,” Sullivan said. “Over the course of several years, I gathered 79 interviews with the band women. I found that once you located one woman, she was in contact with her band sisters, so it made it easy to find the others.” As she collected the oral histories, Sullivan said, she began to realize that there was more to the story than simply women volunteering to play an instrument during wartime. “I realized they were all telling me it was the most important event of their life. I found it curious how playing in a military band for just 30 months could equate to ‘the best time of my life’ – for an octogenarian!” Sullivan found that there were more than a half-dozen permanent-duty women’s military bands, a recreational concert band and several drum and bugle corps during the war, and perhaps more that she did not learn about. Some of the women also did double-duty performing in all-female dance bands at their bases and on tour. Each branch of the service had at least one band. The first Women’s Auxiliary Army Corps (WAAC) band – and the first women’s military band formed during the war – was organized at Fort Des Moines, Iowa, in July 1942. There was such a strong response to the recruiting that a half-dozen bands were formed to serve the various WAAC bases throughout the country. The Navy WAVES – Women Accepted for Volunteer Emergency Service – ensembles were “vastly different” from the other military ensembles, Sullivan said, because of Navy traditions, the multiple locations where WAVES trained, and the lack of a musicians’ rating for women. Unlike the other military branches, the Navy musicians practiced and performed on their own time, as “extra service done in a martial or recreational capacity to boost the morale of fellow WAVEs and themselves.” The Coast Guard SPAR (“Semper Paratus” – “always ready”) band had perhaps the most interesting accommodations – the Biltmore Hotel in Palm Beach, Fla., which the Coast Guard took over in 1943 to use as a SPAR enlistee training center. SPAR was the only female military ensemble to give the members special musicians’ ratings and an insignia to wear on their coat sleeves, according to Sullivan. This year we honor the 100th anniversary of the birth of one of America’s most prolific composer and arrangers Clare Grundman. It is sad to note that very little has been written about him despite the fact that nearly every band musician in America and Canada has had the privilege of playing his wonderful compositions and band libraries across North America are filled with his magnificent music for band. He was born on May 11, 1913 in Cleveland, Ohio. In his adolescent years, Clare participated in the Shaw High School Band in East Cleveland where he played clarinet. Following his high school graduation, Clare pursued his interest of science at The Ohio State University where he completed his bachelor of science in education degree in 1934. While in his undergrad at Ohio State University, Clare continued playing clarinet, while also learning the saxophone. He gained experience performed in an orchestra performing on trans-Atlantic passenger ships such as the French Line SS Normandie.. He soon became an instrumental music teacher where he taught for three years in Ohio and Lexington, KY. Preceding his music teacher status, Grundman returned to Ohio State University to pursue his new interest of the arts and earned his master of the arts in 1939.and studied with Paul Hindemith. Grundman became the assistant director of bands at Ohio State University and taught both orchestration and woodwinds. Three years later, World War II began and Grundman served his country as chief musician in The United States Coast Guard band leaving his position at Ohio State as assistant director of bands in 1941. After the war he concentrated on composition and received many awards for his efforts in radio, television, motion pictures, ballet and Broadway. Grundman’s hard work and participation in many ensembles led him to be honored by each of the primary professional band organizations including The American Bandmasters Association, awarding him the Edwin Franko Memorial Citation, the American School Band Directors Association presenting Grundman with the Kappa Kappa Psi Distinguished Service Award, The John Philip Sousa Foundation awarding the Diploma of the Sudler Order of Merit and a highly respected honorary member of the Women Band Director National Association, currently known as Women Band Directors International in 1974. Not ten years later, Grundman was awarded one of the most prestigious awards, given by the National Band Association, the AWAPA (Academy of Wind and Percussion Arts). Last but certainly not the least; Clare Grundman was elected to membership in the American Bandmasters Association in 1985. Grundman was an intelligent musician whose passion for music drove him to compose both original and arranged works for several ensembles including symphony orchestra, Broadway musicals, ballet, radio, television, motion pictures and concert bands. Clare Grundman is one of the most influential composers of band and wind ensemble repertoire, with works dating from the 1940s. As a skilled orchestrator and gifted composer, he took a special interest in creating music for school ensembles, and remains one of the most performed band composers today. This collection spans more than four decades of his creative output and includes Kentucky 1800, An Irish Rhapsody, Concord, Little Suite for Band, Fantasy on American Sailing Songs, Hebrides Suite, American Folk Rhapsody No. 1, American Folk Rhapsody No. 2, Little English Suite, The Blue and the Gray, and Two Moods. The Pacific Tattoo returned on the weekend of July 13th and 14th with a new program of amazing pageantry, music and dance. International Bands from Australia and the Netherlands performed, as well as Police and Fire Service members and massed pipes and drums. They presented two world-class performances. The Tattoo sparkled! A Terrific production from start to finish with excellent continuity. The tattoo was dedicated to Police and Fire Service members. The show opened with the entry of performers in various items of dress to re-enact the history of Victoria Fire Fighters and Police. Later we saw, the Naden band marching on with a naval contingent with the band playing” Heart of Oak” Other great moment’s included the entry of the massed Pipes and Drums which was both exciting and awesome. In a salute to the RCMP the military bands entered playing the RCMP march past which is not heard very often and was composed by Captain Charles O’Neill. The bands marked the finale with playing of a golden oldie and most appropriate called the Bond of Friendship march by Mckenzie Rogan. The pipes marched off to the great and inspiring march Black Bear. The RCM drill team added a brilliant lustre to the proceedings. The audience came from far and wide with visitors from the USA in attendance as well as other countries. The Pacific Tattoo is a first class production. The Victoria Military Music Festival Society (VMMFS) was incorporated under the BC Societies Act on June 8, 1993 and became a Canadian registered charity in 1996. Originally developed to meet a growing interest in military music in the Victoria, BC area, the VMMFS has produced an extensive number of festivals and shows with performers from around the world since its first production in 1994. One of the board members is Roger McGuire. He is one of Canada’s finest Pipe majors and Altissimo is proud to present him on the album Canadian Bagpipes American Brass. The earliest known photographs of an American military band displayed with the Drum Major in full military regalia, including the busby, is the United States Military Academy at West Point -1864 and the United States Marine band in the same year. The busby should not be mistaken for the much taller bearskin cap, worn most notably by the five regiments of Foot Guards of the Household Division (Grenadier, Coldstream, Scots, Irish and Welsh Guards). Around 1900 the word "busby" was used colloquially to denote the tall bear and racoon skin "caps" worn by foot guards and fusiliers and the feather bonnets of highland infantry. I visited the USS Arizona site for the second time in 3 years recently while on a visit to Hawaii. There is something very compelling for me because it spelt the end for so many naval personnel and certainly because of the loss of an entire navy band. The quiet on the remnants of the ARIZONA is overwhelming and as the oil drips which is clearly a phenomenon it signals the lives lost in an almost musical fashion- that of the slow march. The United States Marine Band is the premier band of the United States Marine Corps. Established by act of Congress on July 11, 1798, it is the oldest of the United States military bands and the oldest professional musical organization in the United States. I listened carefully to all of the marches on this album, with two perspectives. The primary role of any album is to entertain. I asked myself did the music translate for me a vision of the circus. For example the image of entire company marching into the Big Top to the strains of Entry of the Gladiators by Julius Fucik .Was there a visualization of the humour of several clowns entering and leaving a tiny Volkswagen to Fred Jewell’s Battle Royal. Could I conjure up delightful clown pratfalls to the lighthearted and very humorous Miss Trombone -a slippery Rag? Did the march The Big Cage present a mental picture of famous lion tamer Clyde Beatty? Suddenly I could feel the excitement growing, my joy at hearing and reliving my own experiences. Welcome to the Big Top, where feats of amazement happen every day! Lively music is the familiar soundtrack to this spectacle of wonder and awe, and this circus music is performed to enhance the atmosphere of the show for performers and audiences alike. While circus music encompasses many musical genres, including the waltz, ragtime, Latin rhythms and more, none are as popular as the circus march, also known as screamers. Ringleaders demanded the screamers to stir the audience and get them excited about an upcoming performance that was sure to thrill! Close your eyes and smell the popcorn as you envision the elephants stomping, the trapeze artists swinging, and the clowns juggling while you’re entertained with the fabulous circus marches presented on this album. 20th century March composers all owe a debt of gratitude to Claudio Grafulla, whose outstanding composing, arranging and directing helped to bring bands into the modern era. He not only transformed "quicksteps" into modern marches, but also was one of the first to include woodwinds in brass bands. Claudio S. Grafulla (1810–1880) was a composer in the United States during the 19th Century, most noted for martial music for regimental bands during the early days of the American Civil War. It has always been told in our family that in 1943 he won a medal in Edinburgh, playing with Shotts and Dykehead, the first Canadian to win a medal in Scotland, and apparently, it caused quite a stir. Tthey did not know he was a Canadian when he won it. I have sent a letter off to see if they have any record of this, but haven't heard back yet. I believe this was where he trained for Pipe Major. Dad trained in Edinburgh and with the 48th Highlanders in Toronto and went to war with the Toronto Scottish. The Jerome Gatehouse Collection is a unique Military Band Archive of more than forty thousand items; Jerome spent twenty seven years of his life collecting it all together. Although Jerome couldn't play a note and was only in the TA for a little while he loved Military Music and Bands. Whilst working as a store man at the Ebbw Vale Steelworks in his early twenties he was looking for a hobby and decided to collect photographs of Military Bands. This was the start of a lifetime’s passion and the "building up" of a unique international archive of Military and Police Bands of the World. The Collection contains the history of two thousand Bands of the world and comprises recordings, photographs, programs, videos, books, and artifacts in fact anything to do with Military Bands Jerome collected. In the United States, the United Kingdom, and Australia, March is designated as Women's History Month. During this month, we take the time to highlight the contributions of women to events in history and society. In Paul Bierley’s book “The Incredible band of John Philip Sousa” he discusses one of the most intriguing aspects of the band, the vocal soloists. Many of the vocalists sang their way to stardom and appeared with the band beginning in 1893 until the demise of the band in 1931. This idea definitely enhanced the luster of the band over the years of its existence. John Philip Sousa was an iconic figure throughout his career particularly because of the band tours across the North American continent, and Europe. He and his astonishing band were frequent performers in Canada. Through the course of the touring Sousa band career he visited Canada several times beginning in 1893 when he made his first appearance at the Opera House in Hamilton, Ontario. The band returned with a flourish in 1894 by playing two concerts in Montreal followed by Peterborough and two performances in the Massey Music Hall in Toronto. This opulent structure had opened on June 15th 1894 and Sousa and his band played three concerts in the brand new facility beginning on the 22nd of June. The Toronto newspapers gushed with superlatives. Canada once appeared on the Sousa band agenda in the 3rd band tour of 1895. The success of the Massey Hall concert had spread and the band was invited not only to the Province of Quebec cities of Montreal and Quebec City, but also to the Maritime locations of St. John and Moncton, New Brunswick, and Halifax, Nova Scotia. In addition, Ottawa and London, Ontario were included.